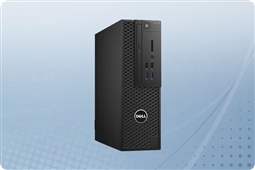 The Dell Precision 3420 is the ideal entry level workstation for the end users needing to run resource hungry application, but may not have budget for many more expensive workstation business computing solutions. The Dell Precision 3000 family of workstations was also created to be the most space conscious answer to high performance computing with it’s small form factor chassis. The Precision 3420 also utilizes the processing power of either the Intel Core i3, i5, and i7 6th Generation or E3-1200 v5 family processors with processing speeds of up to 3.7GHz, CPU cache of up to 8MB, and core counts as high as four cores. Memory is scalable across 4 DIMMs with a maximum capacity of 64GB of DDR4 RAM, and storage is equally customizable with hard drive upgrades available up to 4TB in capacity. Aventis Systems is happy to offer the Dell Precision 3420 Tower Workstation in Brand New condition. All Aventis Systems Workstations come standard with a 1 Year Essentials Warranty with upgrades available to Express, Extended, and Secure Drive media retention warranties. So shop below for the top customization and performance for your most resource hungry applications and workloads with the Dell Precision 3420 Workstation!